This page is work in progress. Information are being added and edited on daily basis. 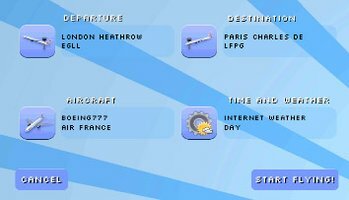 This is the "Create Flight" menu which allows you to select departure and destination which is mandatory before flying. Click on the aircraft button to select aircraft and airline. Click on the weather button to set flying conditions. This is the menu for selecting departure and destination airport. First tab let you search by airport name or ICAO. Second map view tab let you tap on a position listing airports close by. The left side lists any matches found. This is the weather conditions and time of day menu. If you wish to enable realtime internet weather simply click on the mobile/wifi button. Please note this require you to be connected to internet while flying. The data retrieved is minimal. Bottom rows allows you to set either dawn, day, dusk or night flying. Button on far right will select this automatically based on mobile system time. Even if you have a devices with low performance you should still be able enjoy a smooth experience. Turn off generation of buildings. Go to scenery settings, set "City Autogen Density" to None. Turn off in flight city labels. Go to HUD settings, untick "City Name Labels"
Go to terrain settings, lower texture quality filter and terrain geometry detail. Go to fx settings, untick "Lens effects" and "Wind effects"
City Autogen Areas: Which areas should be filled with meshes, only city centers or everything including suburb areas. Terrain Shading: Choose between "Painted Texture" or "Satellite Imagery". Please note satellite is only available when your device is connected to internet. This might be data heavy so please make sure to be connected to a WiFi. Texture Quality: Filtering quality of textures. Geometry Detail: Geometry detail of the terrain. Geometry Quality Filter: Geometry detail fall off. * Choosing a value which is too large for the memory available in your device might result in a force quit of the application. ILS: Draw ILS marker on the screen while landing. City Name: Shows a name label over the position of a city. Wind Effects: Draw wing wind effects. Airplane Shadow: Draw shadow of the aircraft. High Resolution Sky: Sky rendered with high resolution.